Did you know you come fully equipped with a Divine Soul Plan (your purpose in being here) with each lifetime? It is up to you to choose to activate it or not through your freedom of choice and will. 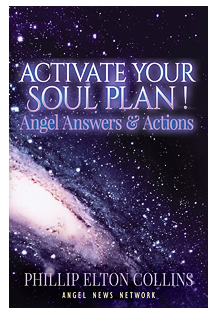 This book is filled with tools to teach you how to activate your soul plan. There are angel answers and actions throughout this endeavor to support your call-to-action giving you a foundation like never before to know who you are and why you are here. Open this book at any random chapter teaching and see what your soul plan can receive right now. If you are ready to receive a major divine download of information dare to read the entire book. Many of us are aware that our planet and species are experiencing a shift like never before in our recorded history. Actually, shifts like we are experiencing have happened before in past golden ages. Now the old paradigm of our governments, religions, corporations, educational and medical institutions (which control us) are once again not meeting the needs of the people. We are waking to this reality and are preparing to create a new reality of equality, harmony, and balance. This will be accomplished through the activation of our soul plans. Many of the tools and teachings to effect change are coming from higher realms, not the human mind. This is a challenge for some, but not for many others. The truth is that these higher forces have been helping move humanity for eons toward a divine destination of unity and oneness. Are we ready to accept that forces outside ourselves can and will assist us in creating a world that reflects a “universal wisdom” and allows us to move into an evolved reality? Through our discernment and resonance (how we think and feel about something, an internal gyro system) we can employ this higher support or not. There are many human teachers and messengers receiving guidance from higher realms and bringing it to us. How do you know what is true and who to trust? Let’s create some guidelines that can help us. BEING THE MESSAGE: Notice if the ones bringing higher truths to us appears to have a private and public persona that are not the same. There are those teaching one thing and being another. This deceit will no longer work in our world of fast cyber communication and transportation. Are they trying to sell you something, a remedy or workshop, at an inflated price that reflects their wounded ego? BEING IN A PERSONAL PROCESS: It is essential that we be involved in a deep examination of the self through a process that supports our highest good. We can do this alone or with others. There are many metaphysical therapists trained to support this process. Use your discernment and resonance to find the one that feels right for you. Our personal growth is a process of inside out, not outside in. If someone tells you otherwise, use your discernment. If someone is attempting to fix you from the outside in—“take this, do that”—beware. Apply what resonates on your own. YOUR DIVINE BIRTHRIGHT: Know in your heart that whatever is happening within you and the world is a divine process unfolding. No one else is “making” anything happen except you, being supported by higher realms (whatever you choose to call them). Our ability to grow and expand is a natural part of who we are. Awakening/remembering your divinity (not necessarily associated with any religion) is key. You are divinity expressing itself each and every moment. Look at the world around you; “we the people” are demanding our divinity and equality. SPIRITUALITY IN THE WAY: Let us be careful that “thinking” we are spiritual is special or makes us better than anyone else. As in many human matters, spirituality can be used to say one is special and knows the true path to enlightenment. There are many paths to the same destination. We are all going to get “there”; it’s just a matter of when and how we choose to learn. It’s your divine right to be or to do so. Each one of us is on a unique place on our path. Accept this with compassion for self and others. IT’S ALL ABOUT LOVE: We are all on this planet, a “LOVER-VERSITY,” to learn to love self, which allows love of others. If we so choose, we can create communities of equality, harmony, and balance that support a universal cosmic love. And if we choose, we can and will create a new golden age of Oneness. What do you choose? Allow these wisdoms within each of us to activate our soul plans. To see our Blog please visit BlogSpot.